As I was driving to and from yesterday running errands and checking things off my to-do list, I found myself taking several deep breaths of contentment. Why? All around me, the colors of fall were bursting forth in nature, on front porches, and in store window displays. Truly, it seems that fall is the season where God simply says…sit back and watch me paint the world for you. Because we adore this time of the year and all the decorative musings it supplies, we are so excited to bring you our first Mood Board from Classic Tassels and More. What’s a Mood Board? Pretty simple, actually. It’s a collection of images, usually organized under a certain theme (our theme for today is October), meant to offer a bit of inspiration, a few warm fuzzies, or just a deep breath of contentment. Here’s our October Mood Board with a few cozy inspirations for the fall. Links to each picture in the board can be found below the board if you want to know more. Take a deep breath and think October, southern, hospitality, and warmth. Pumpkin Tassel from Classic Tassels and More. See more of our seasonal tassels here. 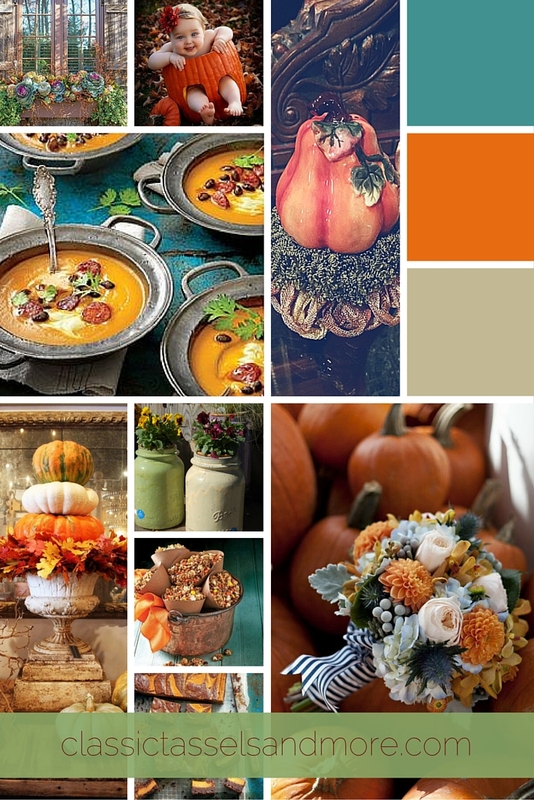 What’s your favorite inspiration from our October Mood Board?